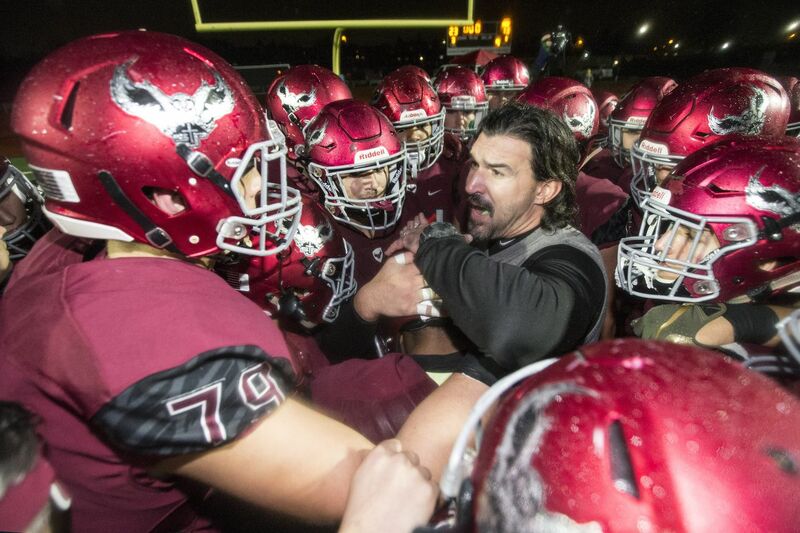 St. Joe’s Prep head coach Gabe infante huddles with his players after the Hawks topped La Salle, 23-13, for the Catholic League 6A title. La Salle was exactly where it wanted to be early in the fourth quarter of Friday night's Catholic League Class 6A championship game against considerable favorite St. Joseph's Prep. The Explorers held a slim lead and in were in position to claim the program's first title since 2015. But the Hawks produced a pair of touchdown passes in a 5-minute span and earned top honors for the fifth time in the last six seasons with a 23-13 triumph at Northeast High. Myles Talley, top, of St. Joe’s Prep celebrates after sacking La Salle quarterback Sean Daly during the 4th quarter in the Catholic League 6A championship game on Nov.9, 2018 at Charles Martin Stadium at Northeast High School. In cold and damp conditions, La Salle nearly reversed a 49-12 loss to the Prep in a Red Division contest on Sept. 28 at Widener. The Explorers repeatedly squashed the Hawks' rushing attempts in the mud, holding Gabe Infante's squad to 71 yards on 27 attempts. Quarterback Sean Daly's 1-yard sneak gave La Salle a 13-10 advantage midway through the third quarter. A double pass for a 22-yard gain helped set up the go-ahead tally. The Prep struggled due to multiple dropped passes on a wet turf field, ill-timed penalties, and an ability to sustain drives on offense. Early in the fourth quarter, on fourth-and-7 from their own 31, the Explorers rolled the dice by faking a punt attempt. But fullback Liam Tatlonghari was stopped for a 4-yard gain. L-R: Zach Buggess, Jeremiah Trotter, Jr., and of St. Joe’s Prep upend La Salle quarterback Sean Daly during the 2nd half in the Catholic League 6A championship game. On the ensuing play, up-and-coming sophomore QB Kyle McCord delivered a 35-yard strike over the middle to Anthony Rigthley to put the Hawks (9-0) back in front. With 4 minutes to go, McCord and Johnny Freeman connected for a 2-yard TD that all but sealed the Prep's third straight crown. The Hawks advanced to the PIAA District 12 Class 6A final at 6 p.m. Saturday back at Northeast. They will play the survivor of Saturday evening's Public League tilt between Central (2-9) and Northeast (6-2). McCord completed 13 of 27 passes for 257 yards and three scores against a gritty and improved La Salle defense. In the second quarter, McCord calmly gathered a high snap from center and lofted a 5-yard pass to Marvin Harrison in the far right corner of the end zone. The Explorers (5-6) evened things later in the frame on Daly's 36-yard pass to Luke Hardy. Freshman Antonio Chadha's 20-yard field goal just before intermission gave the Prep a 10-7 edge. Andrew Bailey, right, of St. Joe’s Prep celebrates with teammate Nick Yagodich, center, after sacking La Salle quarterback Sean Daly during the 4th quarter in the Catholic League 6A championship game.